Tray Player Lite. Tiny player, big tunes! Neonway, a mobile app developing company based in Darmstadt, Germany, will release Tray Player Lite on (13.05.2017) on Mac AppStore. (https://itunes.apple.com/app/tray-player-lite/id1232556394?mt=12). This is a free app that allows users to play audio files on their computer. Tray Player Lite quickly sorts through the files that the users Drag & Drop into the app, and plays only the files that contain audio. – is easy to use, with controls resembling those of a hand-held MP3 player. – Has 3 Drag & Drop locations: the app window, the app icon in the status menu, and the app icon in the dock. 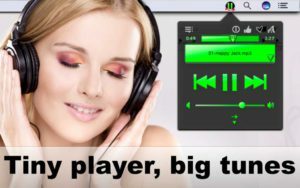 For more information about Tray Player Lite, please watch our YouTube video https://youtu.be/orGUTjSZ-wk?list=PLuaVbnfoG3qdIk8KcNdFjBy4tXXQHKTKK and please read the complete app description at (https://neonway.org/trayplayerlite/).